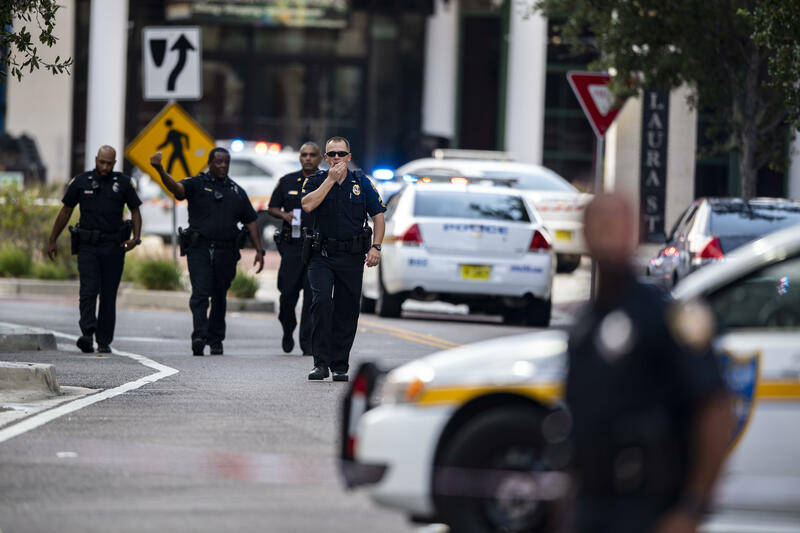 Two people were killed and 11 others injured when a gunman opened fire Sunday at a popular waterfront mall in Jacksonville, Florida, where a video game tournament was being held. Graphic recordings from the scene captured gunshots ringing out and the screams of terrified patrons taking cover. David Katz, 24, of Baltimore, Maryland, is believed to be the gunman, Jacksonville Sheriff Mike Williams said. Katz used a single handgun to carry out the shooting and died from a self-inflicted gunshot wound, he said. Williams described Katz as a white male who was attending the gaming event. He did not know if Katz knew the victims. Nine others were wounded by gunfire and two others were injured as they fled the shooting, Williams said. They are all in stable condition. The tournament for "Madden NFL 19" players was being held at the GLHF Game Bar, which shares space with a restaurant. The bar told CBS News in a Facebook message that all staff members and the owner were able to escape "untouched." Gunshots can be heard in recordings from the tournament on the bar's Twitch account, which was streaming the competition. Williams said investigators were reviewing the footage as evidence and encouraged the public to turn in any additional videos that could help with the investigation. Williams said the FBI is assisting with the investigation in Baltimore. Investigators believe Katz may have stayed in a hotel during the event. Williams said authorities have impounded Katz's vehicle and plan to search it for evidence. Late Sunday night, the FBI said heavily armed agents had entered the family home of the suspect. Dave Fitz told The Associated Press that agents went to the upscale townhouse home of the man's father in Baltimore, but didn't release any further information, citing the ongoing investigation. The AP reports that agents could be seen inside the home near Baltimore's Inner Harbor wearing bulletproof vests and carrying long guns. Reporters at the scene did not see any authorities carrying any bags of evidence outside. Drini Gjoka, who was competing in the event, tweeted about the shooting in the immediate aftermath. "The tourney just got shot up. Im leavinng [sic] and never coming back," he wrote at 1:37 p.m. Four minutes later, he added that a bullet struck him in the thumb, and later called Sunday the "worst day of my life." "I will never take anything for granted ever again. Life can be cut short in a second," he said. There were 150 people involved in the two-day event, including players and spectators. Players were competing for a chance to play in the final round in Las Vegas. "This is your chance to earn your spot in the first Major's Live Finals happening in October 2018," the Facebook page for the event reads. "Don't hesitate to secure your spot!" Florida Gov. Rick Scott, who was traveling to Jacksonville, tweeted that he offered state resources to the local law enforcement. His office said the Florida Department of Law Enforcement and Florida Highway Patrol were assisting in the investigation. EA Sports said it was aware of the shooting and is working with authorities to gather information. "This is a horrible situation, and our deepest sympathies go out to all involved," the company said. "Our focus right now is on those affected, and supporting law enforcement as they continue their investigation into this crime." EA Sports lists Katz as a 2017 championship winner. The NFL issued a statement saying it was "shocked and deeply saddened by the horrific tragedy" in Jacksonville. "We support our partners at EA Sports and will continue to monitor developments with local law enforcement." Democratic Leader Nancy Pelosi said in a statement Sunday, "Congress must stop stalling and act to protect Americans from the gun violence epidemic, and ensure no other family or community has to endure this unspeakable pain. Every day it fails to act is a stain on our nation."